Celebrating 25 years of experience supplying waste and recycling equipment, both Australia wide and internationally. Wastech consultants have an extensive industry knowledge coupled with state of the art equipment that will save you both time and money. 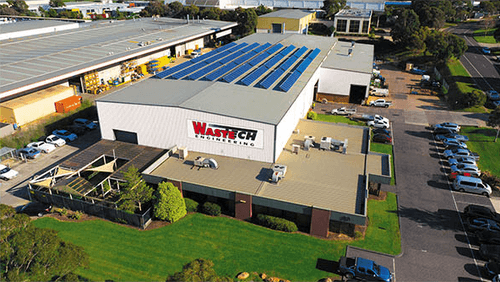 Established March 1993 in Victoria, Wastech Engineering now operates in all states of Australia, New Zealand and other International markets. Head office and the main manufacturing site are based in Hallam, Victoria. We use Wastech to supply and service our balers nationwide. I find their service is always helpful and prompt. Their ongoing maintenance support across our store network is fantastic and the ongoing support they provide our stores is outstanding. Wastech was founded over 25 years ago by two brothers, Neil and Paul Bone along with a small staff who still remain with the company to this day. From modest beginnings in 1993 with a core mission of solving our customer’s problems, Wastech has continued to grow year-on-year while still maintaining the same core mission. 16 years ago, recognising that our customers needs were evolving, we became the Australian agent for Danish vertical baler manufacture, Bramidan. Bramidan Balers were introduced into the market with instant response, building the brand and market share to out rank local and international competitors nationally. Whether it’s general waste, cardboard, plastic, e-waste or polystyrene, Wastech has a solution for your site. From Melbourne to Darwin, Brisbane to Perth, Sydney to Adelaide; our waste management consultants are able to tailor solutions for each unique site to save on costs, while promoting a sustainable future. Our national 24 hour, 7 day per week maintenance and breakdown response service, ensures all our products, including compactors, balers, chutes, transfer stations and material recovery facilities, can continue to operate around the clock. Our waste management consultants are available to provide you with the support you need, from initial plans and purchase, to after installation services. Contact us to learn more today. 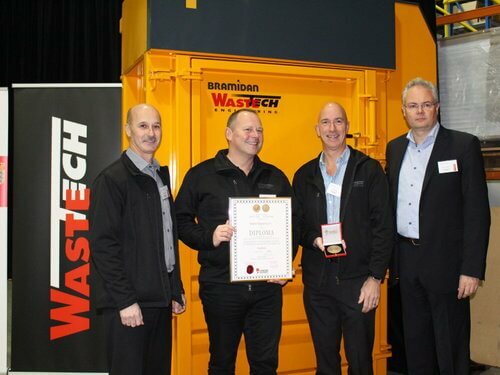 Wastech have been awarded and recognised throughout their 25+ years for outstanding performance as both a small and medium business. His Royal Highness Prince Henrik of Denmark’s Medal of Honour and the Diploma of the Danish Export Association was presented by the Ambassador of Denmark to Wastech’s founders Neil and Paul Bone at a special reception at the company head office in Hallam on 27 June 2016.